Even before I played it I knew I'd have to write a post about Robot Unicorn Attack, a two-button platformer that can be found on Adult Swim's games site. I mean, it stars a frickin' unicorn with a rainbow-colored mane--I can't think of a better game to cover on a blog called "The Gay Gamer," can you? 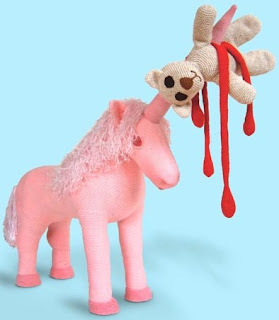 This image isn't related to Robot Unicorn Attack in any way. Thankfully, there's more to the game than a gay-friendly unicorn. Not only does it serve as a fun little diversion from your daily duties (I'd never slack off at work, of course, but I know a number of people who would be more than happy to do so), but it has a subtly wicked sense of humor, too. I'm SO there. Hooray for killing time at work today! I hope you like it, Justin. I'm certainly getting a kick out of it. That. Game. Is. AWESOME! The music makes the game! How fun. It'll tide me over until Bit Trip Runner comes out.